a potential cause for the 400 percent increase in celiac disease over the past 40 years. Wheat’s gliadin protein has also undergone changes, with what appears to be a dire consequence. “Compared to its pre-1960s predecessor, modern gliadin is a potent appetite stimulant,” explains Dr. Davis. 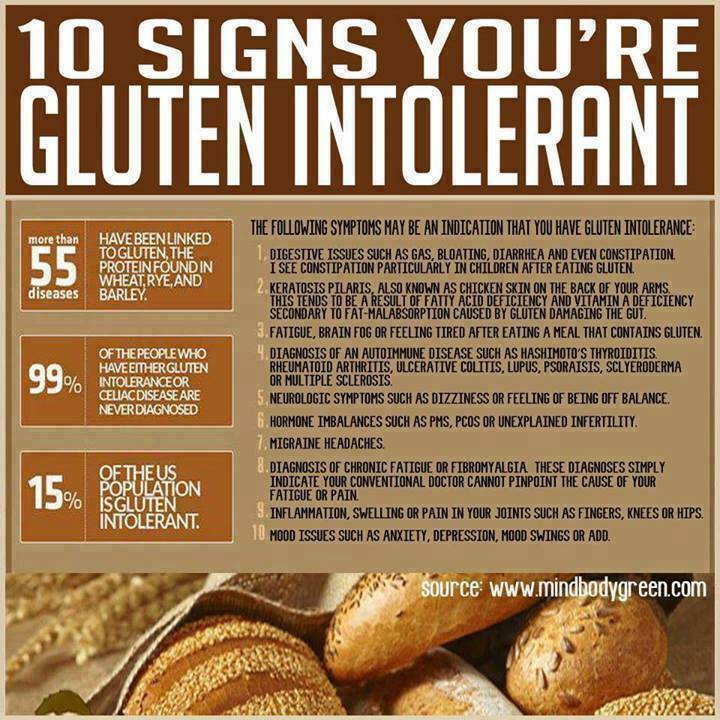 An intolerance to gluten can cause a wide array of symptoms, some debilitating. Moreover, delays in diagnosis or common misdiagnoses can be devastating to long-term health. Gerta Farber elaborates on her research and personal experience with Celiac disease. which is largely responsible for many of wheat’s pervasive, and difficult to diagnose, ill effects. Researchers are now discovering that WGA in modern wheat is very different from ancient strains. no longer resembles the wheat of our ancestors. so it has a higher yield and contains less nutrients and more carbohydrates. to the increase in chronic diseases and obesity across the globe. which has also made wheat highly addictive. Modern wheat has been hybridized and is different from the wheat commonly consumed 50 years ago. Amylopectin A is the main starch in wheat and has been linked to weight gain and significant elevations in blood sugar. Gluten, the protein in wheat, causes systemic inflammation and can also lead to weight gain and diabetes. Wheat contains morphine-like substances that create an addiction. Think Gluten doesn't affect you? You might be surprised! Gluten can affect in so many ways..
We get used to coping with unwell feelings, thinking it is our normal. Over the years the symptoms gradually increase and we accept them as normal - one by one..
meanwhile - we fear that each drug is damaging our liver, kidneys etc.. There is another normal, where we can feel well every day..
Digestive issues, such as acid reflux, pain under ribs, gas, bloating, cramps, diarrhea or constipation. Children also may have constipation if they are gluten intolerant. Keratosis Pilaris (also known as 'chicken skin' on the back of arms). Other rashes, acne. Fatigue, brain fog, or feeling tired after eating bread or a meal containing gluten. Lupus, Psoriasis, Scleroderma, or Multiple sclerosis. 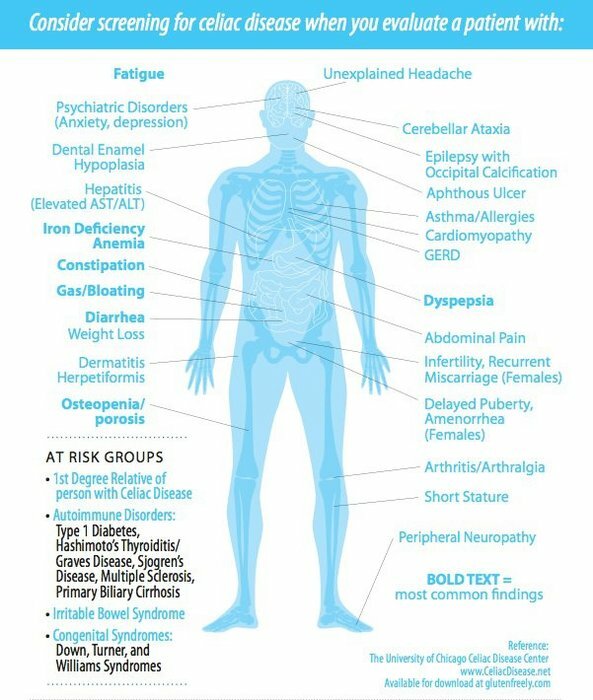 Autoimmune disorders are the #3 killer, behind heart disease and cancer. Neurological symptoms such as dizziness or feeling off balance. Hormone imbalances such as PMS, Polycystic ovarian syndrome, or unexplained infertility/miscarriages. Chronic fatigue or fibromyalgia. Your doctor may not be able to pin-point the cause of your pain. Inflammation, swelling and pain in joints such as your fingers, knees and hips. Mood issues such as depression, anxiety, mood swings, schizophrenia, and ADD. Gluten intolerance is now linked to autism. Wheat Belly, obesity, type-2 diabetes and type-1 childhood diabetes. Wheat is an addictive appetite stimulant." "Not only does wheat contain super starch and super gluten – making it super fattening and super inflammatory, but it also contains a super drug that makes you hungry and addicted. called “exorphins”. They are like the endorphins you get from a runner’s high and bind to the opioid receptors in the brain, making you high, and addicted just like a heroin addict. These wheat polypeptides are absorbed into the bloodstream and get right across the blood brain barrier. They are called “gluteomorphins” after “gluten” and “morphine”. 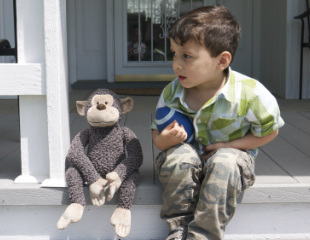 These super drugs can cause multiple problems including schizophrenia and autism. But they also cause addictive eating behavior including cravings and bingeing. No one binges on broccoli, but they binge on cookies or cake. while people who are gluten intolerant continue to suffer a plethora of symptoms. Those people are often told it's all in their heads after testing shows up negative. looks for only one of six polypeptides in wheat, ie gliadin. wheat germ agglutinin, glteomorphin, gltueinin, prodynorphin, and omega gliadin. Any one or a combination of these five can cause anyone to have reactions to wheat. Symptoms alone can be attributed to several other issues. Gluten intolerant or Celiac Disease sufferers will manifest a variety of different symptoms. after spotting symptoms that are all too familiar to you. Sometimes these symptoms appear right after meals and don't last long. (1) Gastrointestinal (GI), stomach, and digestive problems. or an alternating combination of both - IBS (Irritable Bowel Syndrome). (3) Aches and pains - eg Fibromyalgia - not a disease, it's a syndrome. Getting a medical diagnoses is bogus. You don't need to be told you have muscular and connecting tissue aches and pains. That's what fibromyalgia means. Fibro= Connective Tissue; Myo= Muscle; Algia= Pain. Thus fibromyalgia. (4) Emotional issues involving irritability and mood shifts. (6) Fatigue, whether chronic or almost after every meal. Chronic fatigue syndrome (CFS) is, like fibromyalgia, a syndrome, not a disease. If that's what you're diagnosed with, it means your doctor can't locate the cause of your fatigue. Yes, all of these symptoms are common to other health issues and diseases. That's why symptoms alone as a diagnoses is perplexing. I was diagnosed with Multiple Sclerosis. God led me to the info of Gluten free eating. I had to experiment on my own. I don't get flu/colds /hayfever either..I have never taken any drugs for MS.
Thankfully, I read the side-effects and determined to steer clear of drug damage. Yes, we can even recover from autoimmune disease like MS.
First, list every single symptom that nags you, whether sporadic or chronic. Don't make assumptions, like - 'my back problems are from sitting too much'. Just list them without trying to explain them away. Then, go on a totally gluten-free diet for 60 days. If you eat any Gluten, even a crumb -begin again - counting the 60 days. If you feel you can't, then be patient, because gluten is addictive. We are often addicted to things we're allergic to. and a variety of veg, meat and fruit. and triticale wheat which are grains with gluten. BUT you MUST find a brand of oats not grown, transported or processed with wheat. pinenut, coconut butter, sunflower seed butter. sesame, sunflower, poppy, chia, linseed, pumpkin seeds/pepita, psyllium, quinoa. Cooked Quinoa is brill for making fish burgers with thyme, grated carrot and egg. Chia is brill added to coconut cream with natural honey or maple for thick pudding. Packaged foods have different ways of sneaking in gluten. Read labels carefully. Here's a reference site and source for all foods (http://www.celiac.com/). there are many delicious ways to cook GF food. When baking cakes use a mix of flours, eg water-chestnut, millet, rice, arrowroot. After the 60-day period, go over your notes and see how many of your symptoms remain. If they are mostly gone, you might decide to stick with your gluten free diet. If you're uncertain, go back to your former diet to see if those symptoms come back with a vengeance. Also consider how much sugar, processed dairy and meat you are consuming. for an acidic diet of too much acid ie -meat, sugar, rice and processed dairy can cause arthritic type aches. Try to eat 30% acid foods.- ie on your plate heap 2/3 veg and 1/3 meat. The case against gluten seems to have been closed with recent research from a Brazilian research team that published a report in the January 2013 Journal of Nutritional Biochemistry. It seems to have put an exclamation point on the wheat belly controversy. the study was set up to examine the differences in specific genetic and biochemical markers between rats fed gluten and rats that were kept gluten free. The “wheat belly” syndrome and how it leads to other health issues was the purpose of their research. The research team chose biological markers that could indicate the onset of obesity and metabolic syndrome, precursors to diabetes and cardiac issues. that do not build up your health. Because you have been depleted of nutrient for so long, you need to do all you can to eat a nutritious diet. to get your body functioning again. just skip the bread part and roll the lunch meat up with a little bit of mayonnaise, lettuce and tomato. Skewers of meat and chicken with rice is also a fun dinnertime option that does not include bread. Add almonds to stirfries and fried rice. make choc covered bananas, fruit mousses and smoothies are super fun! Freeze bananas and blend into icecream with vanilla -and honey if desired. Use berries sometimes. Gluten intolerance can be an issue that contributes to behavioral problems. is really important to a healthy body and mind. Try it and see if you notice a difference! which causes bodily functions to be impaired. Who should trial a gluten/casein free diet? and almost all other autoimmune diseases. It's not just gluten, it's gliadin in wheat since the 60's - its damaging everyone.